In 2009 I opened my wallet and splurged out on a waterproof rain jacket that has an inner liner which is removable. This jacket saw me faithfully through wet holidays in England, Scotland, Wales, France and Italy. It kept me dry through 6 Cape winters. And trust me, it can rain here! And then this year, on the wettest day on the barge, the jacket said, sorry, no more! It was no longer waterproof. I was soaked and wearing the jacket seemed pointless, but I kept it on. As soon as we got back from France I went to Columbia (the shop, not the country) and they told me to bring my jacket in as they might be able to help get it back to its waterproof state. I also went to Due South and bought another waterproof jacket, in case Columbia could not help me. This was the last medium sized jacket on the rack, in a colour I would wear. The following week I took my jacket to Columbia and they told me to buy a product from Due South that would restore the waterproof feature. So, I popped in, bought the bottle of liquid and put my jacket, together with Dave’s into the washing machine. I tested the jacket and it seemed waterproof, and so I took the new one back. Well, it turns out that it is drizzle proof and not rain proof. I discovered this when I got home drenched after a real Cape storm! So, back I went to Due South and the jacket was still there! Just my luck. And, to make me jump for joy, it was now on sale and I got it at a 25% discount. Win/win all around. Another thing that made me jump for joy was when I saw Manuela publish a recipe for condensed milk. I have so wanted to make a recipe, but as it needs condensed milk I have not been able to do so. But the version using fructose worked so well that I have made batches of the Sugar Free Condensed Milk. I have added spices to some and I have been eating the condensed milk out of the jar it is so good. You will never buy tinned condensed milk again after trying this recipe. This is the easiest sweet treat to make at home! If you don't have glucose powder, just adjust the quantity of fructose. It will work the same. When it starts to bubble like mad take it off the heat immediately. I would never have thought to make home made condensed milk. How clever is that! That’s exactly what I need! Thank you so much for the recipe! Yay – I love getting things at a discount! Glad you got to pay 25% less for that other rain jacket, Tandy! You old one lasted you a long while – good rain free jackets are hard to find! As are good, condensed milk recipes! I’m thinking this would work with coconut milk too? This definitely goes on my list, Tandy, thanks for the recipe! My granny used to make a sweet treat for her grandchildren, putting condensed milk on rusk and sprinkling coarsely ground hazelnuts over it, in the oven until they are golden brown – delicious! 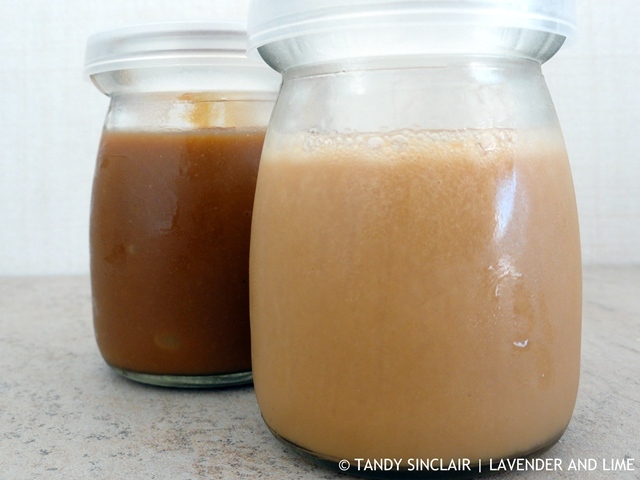 I’ve never even considered making my own condensed milk, but this is such a great idea! And so many recipes require condensed milk and I never seem to have any on hand! So great that you can actually make your own! How fabulous, with fructose as well. So sorry to hear about your rain jacket, ha, it has been raining here everyday! Rainiest summer ever. The one jacket I have doesn’t have a hood even. Oh well. Win-Win indeed. Love that you really wanted to keep your ol faithful rain jacket tho, guess it had done many an adventure with you huh? I do like your recipe, but condensed milk is a treat eat, so not gonna remove the delicious from it. Will forward your recipe to the sister in law, she would dig it. The jacket has seen a lot of the world!